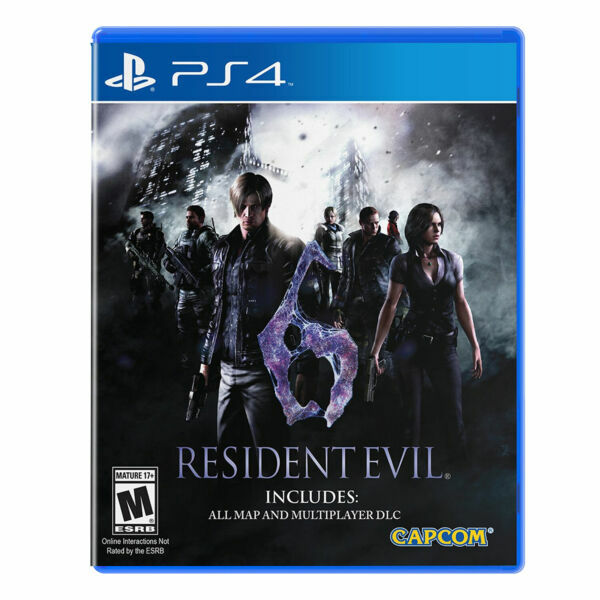 eBay Powered by Frooition About us Shipping Returns Contact us Our Reviews Promotions Resident Evil 6 HD Shop Categories Helpful Links Add to Favorite Sellers Sign up to Newsletter View Feedback Contact Seller Visit seller's eBay Shop About Seller Page Resident Evil 6 HD Item Description Blending action and survival horror, Resident Evil 6 delivers an epic dramatic horror experience. Resident Evil favorites Leon S. Kennedy, Chris Redfield and Ada Wong are joined by new characters, including Jake Muller, to face a new horror, the highly virulent C-virus, as the narrative moves between North America, the war-torn Eastern European state of Edonia and the Chinese city of Lanshiang.Starting with four distinct, yet interwoven story threads, each with their own pair of protagonists for either solo or co-op play, both offline and online, not only does Resident Evil 6 deliver both different perspectives and gameplay styles but, with the introduction of the innovative Crossover mechanic players can team up and share the horror. At key moments during the game, up to four players can join together online to tackle a specific situation, with some stages seeing the usual partnerships swapped to further increase the depth of gameplay.Ada Wong, Resident Evil's very own femme fatale, dives into a thrilling campaign of intrigue and infiltration, featuring unique missions, gameplay and weapons. Ada is available from the start, but with the other campaign secrets within her grasp, it may be best to save this one for last.Features:Horror on a global scale - No longer confined to a specific location, the outbreak of the C-virus is worldwide with the action taking place in North America, Eastern Europe and China.Not only does each story cross paths, but so does the action - At significant points when the narrative draws pairs of characters together, the all new Crossover mechanic allows up to four players to experience the horror together online.Solo or co-op - Resident Evil 6 delivers both single and two player co-op gameplay either offline or online.Agent Hunt Mode - In this online mode for the Resident Evil series, experience the action from the other side. As a hunter, join the enemy side to become one of the game's zombies, J'avo or other C-virus mutations and infiltrate another active game session to eliminate the human characters.Mercenaries returns - Players once more can enjoy the highly popular Mercenaries Mode.All console map and multiplayer DLC included:Siege Mode: Protect the BSAA trainees from the creatures until the rescue effort arrives. Players can choose to be an agent helping the BSAA trainees, or a creature hunting them down in this multiplayer mode that supports up to 6 players.Predator Mode: Become the tracker Ustanak as you hunt down agents. This battle of agents versus Ustanak can be waged with up to 6 players.Survivor Mode: It's a battle between agents, and only the last man standing can be the victor. This mode supports up to 6 players in individual deathmatch or team battles.Onslaught Mode: In this one-on-one version of The Mercenaries, players rack up combo points to send hordes of creatures to their opponent.All the additional stage maps for The Mercenaries and other Extra Content modes are included.Enriched multiplayer matchmaking - Cycle Mode automatically enters you into recommended multiplayer games and Online Campaign Custom Match now includes options to search for a character campaign without having to specify a chapter.Important Information:PSN online features require broadband internet service and a Sony Entertainment Network (''SEN'') Account.Online multiplayer requires an PlayStation Plus membership (sold separately).Game Variation:Actual product received could be slightly different than what picture shows. To clarify the main photo may show the standard edition but you could actually receive the Greatest Hits, Platinum or a store specific version e.g. Walmart exclusive or Best Buy exclusive. Game Manuals Certain publishers have opted not to include physical manuals. If you do not find a manual please visit the publishers website for a digital version. You May Also Like More Items!View more great items Video Games Game Consoles Accessories Toys 2 Life Last Chance About us Shipping Returns Contact us Our Reviews Powered by Frooition Frooition | No-js Template | eBay design, eBay store design, eBay shop design, eBay template design, eBay listing design (ver:froo_no_js) This listing is currently undergoing maintenance, we apologise for any inconvenience caused.